You already know that we stay away from Meatpacking restaurant-club hybrids. Our idea of a good time does not include rubbing elbows with D-list celebs at Spice Market. Nor does it involve poppin' bottles at Provocateur. But somehow, we ended up at Catch the other night, the three story fish-topia opened by some mega restaurant group and, believe it or not, we didn't hate it. In fact, we were actually quite impressed. It is no understatement to say that Catch is the most over-the-top, ridiculous dining operation the Meatpacking District has ever seen. There might be more people occupying the three kitchens here than there are occupying Wall Street...and they all have jobs! As for the crowd? Wow. If this isn't the holy grail of People Watching, we don't know what is. Where do you look first? There's just so much good scoping to do - Euros, models, Suits, old guys with young ladies, and huge groups of females enjoying a Girls' Night Out. This is the definition of non-stop action. With so much going on at Catch, it's easy to get distracted. Just don't forget that you're here to eat. Chef Hung Huynh, who you might remember from Top Chef, has tamed this monster of a restaurant, and has Catch humming like a well oiled machine. The service is fantastic, and the food is pretty great as well, despite the absurdity of it all. The menu starts off with a $100 Oysters & Bubbles option (it would). We skipped that, but tried a big chunk of the other offerings and didn't end up angry the whole time. It turns out that underneath the glitz and the glamour, Catch is a damn fine restaurant. For the neighborhood, this is the place to be if you actually care about eating a good meal while you show off that new suede blazer. Don't worry...everybody sees you. Starting your meal off with a couple of stone crab claws is never a bad idea. When these are in season, Catch has plenty. We really enjoyed this cucumber wrap with salmon, hamachi and tuna. This is the signature special roll at Catch, and you should definitely get one for the table. It's crab and salmon with some miso-honey for that special touch. These crispy shrimp nuggets should absolutely be ordered. I don't love shrimp, but these poppers with spicy mayo are solid. Of all the dishes we tried, this was our least favorite. The bread was a little too much. All we could taste was flour instead of the clam, Parmesan, and garlic that sat on top. Yes, it's $78, but this lobster is a splurge you need to make. It's perfect for sharing, as the lobster comes out as a bunch of tails and claws, and the Cantonese sauce it's cooked in ridiculous. I'm still thinking about it. This snapper dish sounded out of this world, but didn't end up being all that impressive. At $29, you can do better here. What was once the key to Hung's Season 3 Top Chef victory, now resides on the menu at Catch. These brown-butter seared scallops are served on a bed of sautéed cauliflower and pistachio, and they're really delicious. 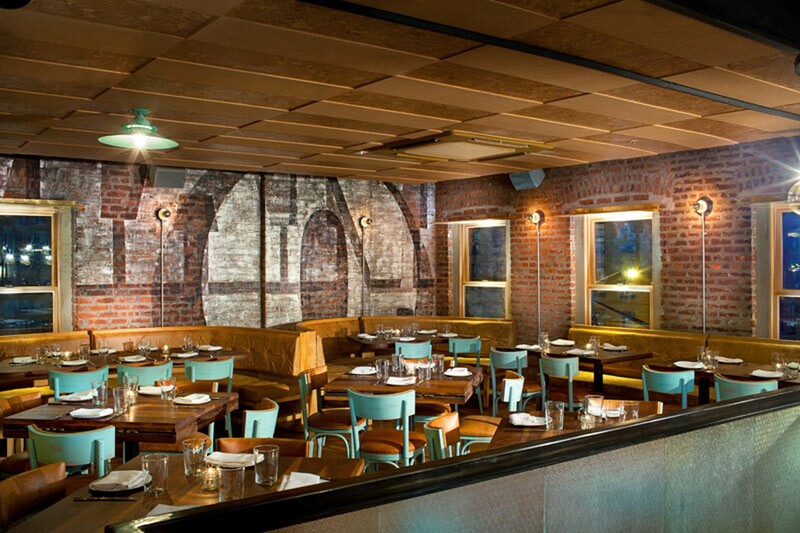 There were exactly zero restaurants we enjoy hanging out in Meatpacking until Santina arrived. Now there’s one. If the Queen Mary just ended up being a nicely appointed tug boat loaded with alcohol and raw oysters, you'd have Grand Banks. Load up on ceviche and fried veggies, just make sure you aren't prone to motion sickness. Docks is a good spot for Happy Hour drinks and snacks near Grand Central. Dirty French is a Lower East Side French restaurant from the people behind Carbone, and like that place, dinner here is definitely an event. A few years in, Soho’s The Dutch is better than it was when it first opened. These days, it might even be underrated. Beauty & Essex is like a ground level Boom Boom Room with food and slightly poorer people. But you want to know the worst part about it all? The food is actually pretty good. Salinas is a Spanish tapas place in Chelsea with some great outdoor seating.